With the baseball season not even a week old, I decided to celebrate the sport I love by changing plans and doing a Phenomenal 5 on baseball movies. At first I thought this was an easy, easy assignment. But before long I had more movies on my short list than I expected. So needless to say this was tougher than I thought it would be. There are some really good baseball movies that aren’t just for fans of the game. Many of these are just good quality movies that any film lover can enjoy. So here’s my list. As always, I wouldn’t call this the definitive list, but there’s no doubt that these five baseball movies are absolutely phenomenal. “Major League” came out back in 1989 and was a big success. It was followed by two sequels but neither could match the original. 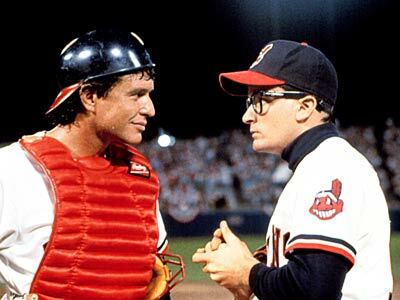 “Major League” was a genuinely funny movie that mixed straight comedy with baseball satire. After a self-absorbed heiress inherits the Cleveland Indians from her deceased husband, she decides she wants to move the team to Miami. To do this she would have to show a worthwhile reason to take the city’s team away. So she fields the worst possible team in hopes of losing games and losing interest from the local fans. The team of misfits features pre-nutcase Charlie Sheen, Tom Berenger, Wesley Snipes, Corbin Bernsen, and more. Add the hilarious Bob Uecker as the voice of the Indians and you’ve got a baseball comedy that truly delivers the laughs. 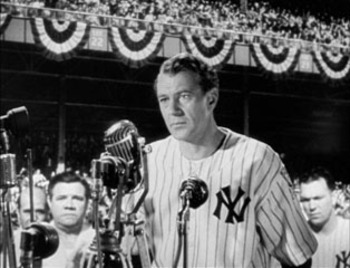 Gary Cooper’s performance as “The Iron Horse” Lou Gehrig in 1942’s “The Pride of the Yankees” is still one of my favorite roles of his. This is a film that was nominated for 11 Oscars including a Best Actor nomination for Cooper. In it you’ll see several real baseball players including Babe Ruth and Bill Dickey as well as a great story about an amazing player and individual. This movie really doesn’t pay close attention to the baseball part of Gehrig’s life. Instead it’s a biography of the highly accomplished yet tragically short life of a man many came to know through the game they loved. “Pride of the Yankees” has a few flaws but it also has a lot of heart and I just have to include it on any list of phenomenal baseball movies. 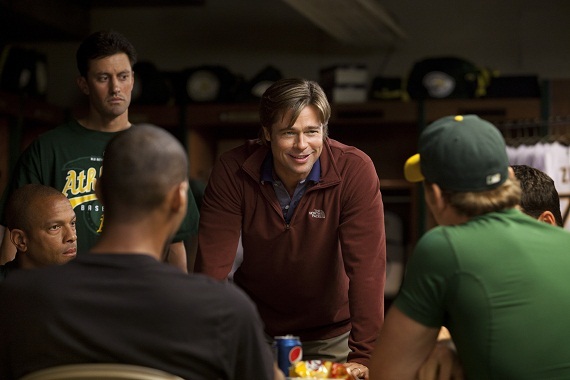 I know that “Moneyball” just came out last year but it really impressed me. Bennett Miller’s baseball movie about Billy Bean and the 2002 Oakland A’s actually made sabermetrics and salary caps engaging cinema. Brad Pitt does a nice job fleshing out Bean and even the usually annoying Jonah Hill manages to keep his performance under control. It’s the story of a miracle team built around a system that should have never worked. Against the wishes of his scouts, coaches, and owners, Bean created a team that made a miraculous run that eventually put them in the playoffs. Again, this isn’t a traditional baseball picture. It looks at a different side of the game that I haven’t seen much of before. But it’s still very much a baseball movie and I thoroughly enjoyed it. Obviously this movie was going to show up on a list about baseball movies, right? “The Natural” is one of those movies that I can stop and watch anytime I come across it on TV. 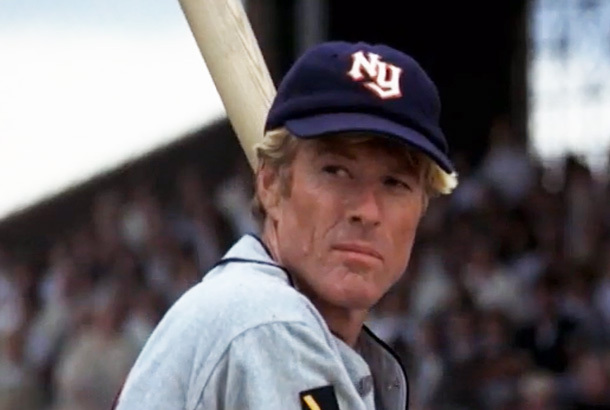 How can you not like Robert Redord as Roy Hobbs and his bat simply called “Wonderboy”? Roy learns about baseball and life the hard way but finally gets his shot with the New York Knights. Sure, a lot of convenient things fall into place that allow him his opportunity but when he gets it, he makes the most of it. Redford is helped by a nice supporting cast and a story that’s sure to leave you with a smile on your face. And I can still hear that music as Roy clobbers a home run that shatters the lights and send sparks raining down on the field. A classic moment. This is a baseball movie that lifts the game up as an almost mystical force. “Field of Dreams” celebrates the game of baseball as the true American pastime. I paints baseball as something beyond just a sporting event that we enjoy watching. But even while it has the most reverent perspective on the game of all the films on my list, it’s really about family and baseball is that link that brings a father and son together. There are so many memorable things about “Field of Dreams’. Who can forget the whispers in the cornfields? “If you build it, he will come”. Who can forget “Shoeless” Joe Jackson first stepping onto the baseball field that was built on a leap of faith? Who can forget James Earl Jones’ speech on baseball? I could go on and on. 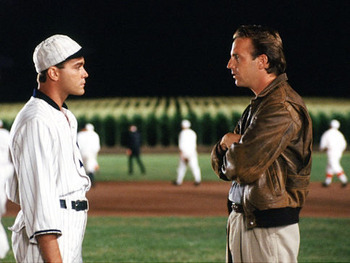 For me, “Field of Dreams” is the quintessential baseball movie. It’s unique but it still brings out my love for the game. Like my list? Do you have a baseball movie that you think should be on here? Did I include a film that you disagree with? Take time to add your comments and don’t forget to share your top 5 baseball movies.